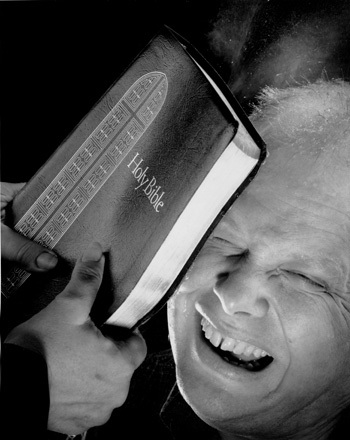 Ain’t going to lie, I have grown so tired of people getting all up in their Bibles in order to get all up in my face. Pushers and pimps of their packaged prescriptions on what “the Bible says.” Facebook pics with font abusing, clever little sayings touting their position on what they are against, fresh off the leather-bound, name engraved, coffee table press. For Christ’s sake, clip art and sun ray scenes are so 80’s. Enough already, people. Enough. Yes, we do have a problem, damn straight we do, starting with the fact that exhibit “a,” the Bible doesn’t “say” jack squat. Hello, hello, is this microphone on? I think I recall Jesus saying repeatedly regarding the “Bible” of His time, “You have heard it was said, but I say unto you.” Notice, He doesn’t declare,”it” said, he says, you “heard” it was said. Why? Because the Bible doesn’t “say,” … it reads. The mistake being made (the only mistake being made) Jesus pointed out to those gathered, was in their hearing. Oh snap, I hate it when Jesus rounds third base. So let’s get real Christian. In fact, here’s an example. It was a sad state of affairs that the Jews, who experienced Pentecost and were the first Christians, did not believe the Gentiles could even receive the Gospel. Talk about inclusion issues. In fact, the growth of the first church was exclusively of Jewish people. So much that Peter had to have an experience with God where He was led to begin to reevaluate his reading of a Biblical text about clean and unclean foods, a metaphoric communication of deeper issues regarding Jews and Gentiles that was about to play out. Cornelius, a Gentile, was led to Peter because of his rumored spiritual experiences. Peter could not begin to fathom, it was so way beyond his window of perspective, that Cornelius could experience God. But once their bumpers were in the same parking lot, face to face, relationship to relationship, Peter was blown away by Cornelius’ receptiveness and spiritually capacity. After picking his jaw up off the ground, Peter, going against his original reading of the Biblical text, shared the Gospel and “boom, there it is,” new life for Cornelius. Let’s just make sure you are getting the picture here, until that experience, Peter adamantly believed, along with the Jews, because of the way they “read” the scriptures, that the Gentiles had no access to Jesus and the Gospel, and even withheld the waters of Baptism because so. So, get off my back (and everybody else’s) and open your ears. Cause right now, you got “jerk weed” written all over your forehead. Your ignorance is making a circus out of this Christian thing and missing the heart and the spirit of Jesus and His Gospel. Come down from your pride, get outside your “church world” fence, and actually sit at the table of the people you hate, and the issues they harbor that you are so against. Maybe then, you can hear the megaphone of Jesus trying to break in and penetrate over the noise of your evangelical earphones… “you have heard it was said, but I say unto you.